All Christians have read much about the power of the word of God in reading their Bibles and also heard much about it in sermons and messages. So why aren't there more people telling about the power of God working in their lives? 2 Timothy 2:13 "If we are faithless, He remains faithful; He cannot deny Himself." Another requirement, in addition to believing and trusting in the power of God's word, for a person to truly see the power of the word of God working in their life, is that we need to desire to read and study the Bible, not merely because we were told to, but because we want to understand the word, getting it deep into our hearts, as the Psalmist said in Psalms 119:11-12, "Your word I have hidden in my heart, that I might not sin against You! Blessed are You, O Lord! Teach me Your statutes!" Only after we know what the Bible says, can we truly live the kind of life that is blessed and pleasing to God. John 14:21,23-24 “He who has My commandments and keeps them, it is he who loves Me. And he who loves Me will be loved by My Father, and I will love him and manifest Myself to him." The third requirement, which applies to all the promises of Scripture, is to live in obedience to God, keeping a right heart, full of love for God and for people. In a heart full of love, there is no place for hate, sin, malice, bitterness, selfishness or negativity. Every day we must live disciplined, faithful lives, pleasing to the Lord and not quenching the Holy Spirit. Let's consider what the Bible says about the" effects of the word of God" in the lives of God's people, the body of Christ. - The word of God produces faith in our hearts when we receive it. When we need the faith that God can and wants to do something for us, we seek the Lord to show us which verses will work for our situation. Then we soak on and meditate on the specific verses daily, even saying them out loud. It is a fact, acknowledged by psychologists, that the human mind believes and applies more easily and quickly when a person hears something from their own voice. To read more about the Holy Spirit, you can see the article "Who The Holy Spirit Really Is." - The word of God, is the seed that produces the new life in us for salvation. The nature of the seed determines the nature of its results when planted. When the seed of the word of God, comes alive in our spirit, and unites with the Holy Spirit inside of us, we become alive for eternity. - The word of God is life and brings health for the whole body for him that finds it. - The word of God makes us wise and gives us the strength to live clean lives. 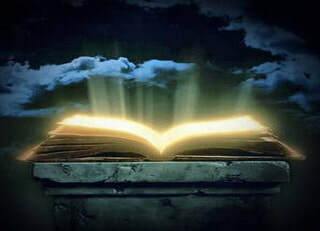 - The word of God illuminates our minds as we study it. Psalms 19:8 "The precepts of the Lord are right, giving joy to the heart. The commands of the Lord are radiant, giving light to the eyes." - The word of God serves as a spiritual mirror, through which we look at the state in which we find ourselves and find out what we need to change or improve. - In the word of God, we find pleasure in the teachings and as we are obedient, we prosper and are blessed. - The word of God becomes alive and working in us, when we believe the Lord and let Him do His work in us. - The word of God brings joy and delight in our hearts, when we feed our souls upon it. - The words of God in Scripture, are spirit and true life for us when we believe and receive them. - The word of God is clean, holy and life-giving truth. - The word of God is food for the children of God, as food is to the natural body, the word of God is to the spirit man. - By the word of God we come to know Jesus and to be truly free. John 8:31-32 “Then Jesus said to those Jews who believed Him, "If you abide in My word, you are My disciples indeed. And you shall know the truth, and the truth shall make you free.'" - The word of God is forever. Isaiah 40:8 “The grass withers, the flower fades, but the word of our God stands forever." The Lord made the same claim as He addressed the disciples about the end times. What a wonderful God we have! He has given us His word so we can learn to know Him and His will for mankind and for us, His people. He has given us His word to show what He approves and disapproves of and in so doing, we find true life! - The Word of God contains everything we need to know. It is the perfect guide for living pure lives and equips us with everything we need to be blessed and pleasing to God. In the book of Hebrews, we read about the importance of the truthful confession of the word, i.e. homología ("common confession" in the original Greek). This term refers to the "collective agreement" of Christians about what the Lord loves and hates - and the courage to proclaim it out loud. In other words, when we believe and proclaim Bible verses, we are agreeing with what God has said, and as a result, the benefits of the word of God become real in our lives. God is faithful and honors His promises. For who? To all those who love Him and live in obedience to Him.